The Manila Ecclesiastical Province School Systems Association (MaPSA), through the recommendations of the 2018MGA Chair, Rev. Fr. 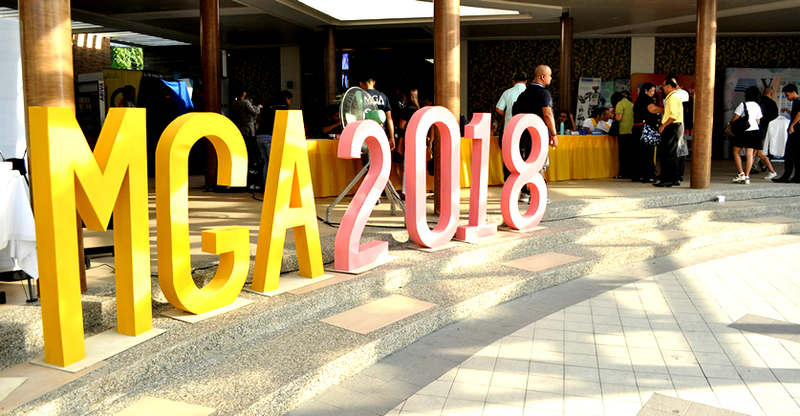 Gerard Joaquin V. Masangya, commissioned Dr. Leo B. Galve, Mr. Joseph S. Cruz and Mr. Great Allan M. Ong to document the 2018 MaPSA General Assembly held at the Grand Cobo Events Place last August 29-30, 2018. 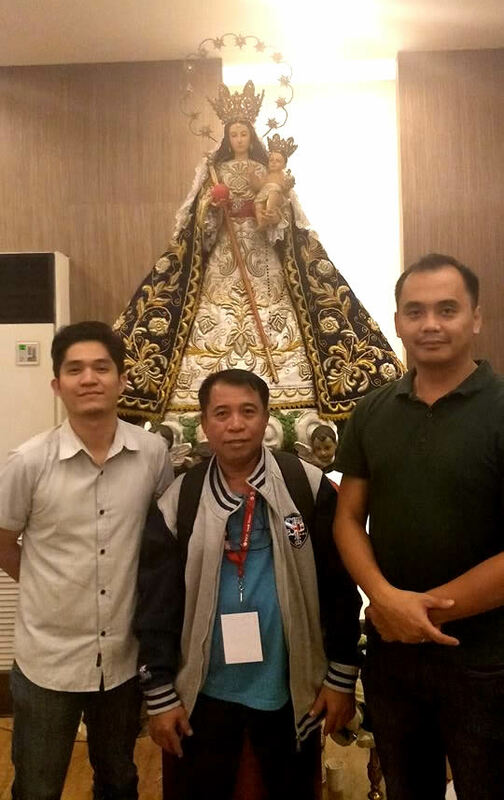 The team was first commissioned to cover the 2012 MGA at Cainta Catholic College hosted by the Diocese of Pasig and since then, MaPSA sought its expertise. The team, headed by Dr. Leo B. Galve, is tasked to prepare the Retrospect of the previous assembly and the Recapitulation of the current. Still photos and movie clips are collected for records purposes while speeches and powerpoint presentations are gathered to comprise the final report for submission to the Office of the Superintendent of host diocese and the Office of MaPSA. Pasig, Cubao, Kalookan, Parañaque, Archdiocese of Manila, and Antipolo are among the host dioceses an d archdiocese that the team has served. Congratulations Documentation Committee as the host diocese of the 2019 MaPSA General Assembly has sent feelers for engagement through Rev. Fr. Flormonico Cadiz, Superintendent of MADICSA. Dr. Marcella D. Bejado, School Principal of Sto. Niño Parish School and Sto. Tomas de Villanueva Parochial School was nominated by the Director, Dr. Leo B. Galve, to the Sedes Sapientiae of the Manila Ecclesiastical Province Schools Association. The Sedes Sapientiae is the distinction given to personnel of over 100 member schools of MaPSA. 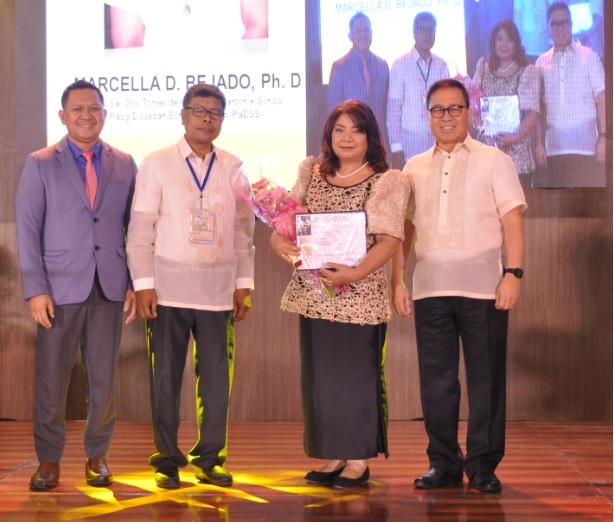 This year, during the 2018 MGA, held at the Grand Cobo Events Place in Marikina City, last August 30, 2018, the Committee on Awards headed by Dr. Anthony P. Venus, is recognizing dedicated Academic Teaching and Academic Non-Teaching Administrators. The Committee was able to identify 20 nominees with 11 from the Academic Non-Teaching and 9 from the Academic Teaching Administrators where Dr. Marcella D. Bejado was qualified. The objectives of the award aim to recognize the important roles of administrators in the realization of the school’s vision-mission and that of MaPSA and to inspire other nominees to continuously strive for excellence and professionalism in the workplace by being a truly Catholic worker. The criteria for evaluation of the nominees are personal qualities and character, supervisory skills and leadership qualities and professional, community and parish involvement. Congratulations, ever-gorgeous Dr. Marcella D. Bejado for making both Sto. Niño Parish School and Sto. Tomas de Villanueva Parochial School proud in earning the favor and recognition of MaPSA. Mr. Arturo Santos, Assistant to the Finance, Mrs. Nenita Alamo, Maintenance and Mrs. Candida Fungo, Canteen Assistant, joined the Annual Planing of Santo Tomas de Villanueva Parish held last August 17-18, 2019 at St. Michael Retreat Center in Antipolo City. These three school personnel are active volunteers of the Parish. Mr. Arturo Santos is an Execom Member of Parish Pastoral Council and Couple Coordinator of Family and Life Ministry. Mrs. Nenita Alamo is the Coordinator of Worship Committee, Treasurer of BEC Core Team, and a member of the Lector and Commentator Ministry. Mrs. Candida Fungo is the Coordinator of the Mother Butler Guild and member of Collectors and Greeters. Before they worked in the school, they have been active workers in the parish. Some programs were identified for the school’s active participation. Dr. Galve, School Director, joined the second day of the planning on August 18, 2018. He said that sending representatives to the parish planning provides the school a venue for active involvement. 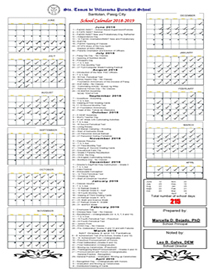 Once the Calendar is approved and published, a copy for all school offices shall be provided. Rev. Fr. Darwin L. Calderon, Parish Priest and Chaplain facilitated the Planning. Santo Tomas de Villanueva: Pray for us! Sto. Tomas de Villanueva Parochial School and Sto. Niño Parish School represented the Annual Corporate and Membership Meeting of MaPSA for the current school year last August 17, 2018, 4th floor, Arzobispado de Manila. Dr. Leo B. Galve, School Director of both schools, hopes to have a glimpse of the schools’ stand in MaPSA. The Corporate Meeting was presided by His Excellency Luis Antonio Cardinal G. Tagle. The President’s Report contains the Minutes of the Previous Meeting, Resolutions, MaPSA Member Dioceses, Enrolment Statistics, and Activities. Prior to the Election of the Members of the Board of Trustees, Rev. Fr. Orlindo F. Ordoña presented the Audited Financial Report. STVPS and SNPS are happy that they maintain a stable place in MaPSA. God bless these two schools. 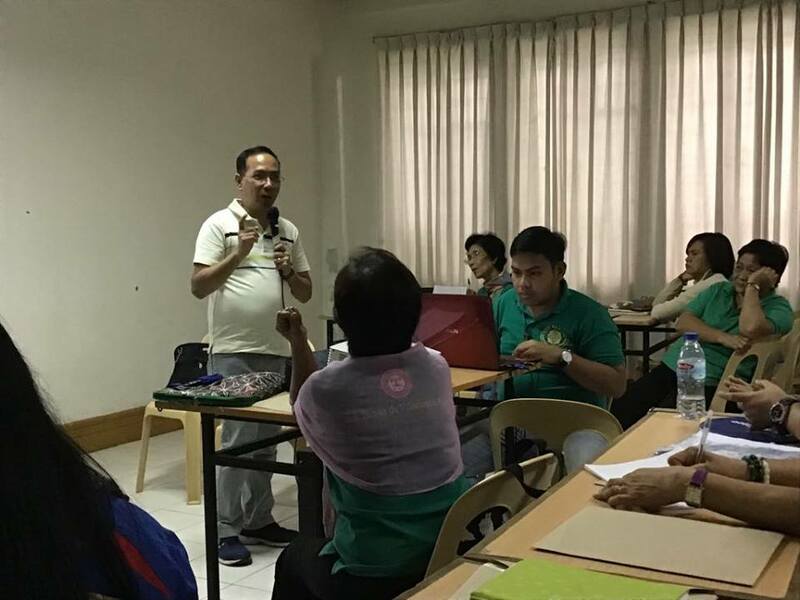 August may seem to be an ordinary month for Dr. Leo Galve when he received an appointment from Private Education Assistance Committee (PEAC) on a commissioned engagement to certify schools in Negros Occidental. Duty dictates him to confirm the invitation after observing protocols. Mr. Rocky Acluba, from PEAC office arranged the itinerary and accompanied Mr. Joselito T. Garcia, Curriculum Specialist and Dr. Leo B. Galve, Administration Specialist as they flew to the City of Smiles on August 5, 2018 aboard Philippine Airline Flight PR 2153. The team headed directly to San Carlos City where the first day of certification is scheduled on August 6, 2018, Monday. In day 2, the team certified a mission school at Don Salvador Benedicto. Early on Tuesday, August 8, 2018, the team certified a family owned school in Murcia. Two schools were certified in Bacolod City, an international school and the high school department of a university. The team flew back to Manila aboard Philippine Airline Flight PR 2154 on August 11, 2018. They believe that private schools are really trying their best to give quality education to future leaders of the country.